AMSTERDAM (AP) — After showing no fear against Real Madrid, a young Ajax squad didn't back down against Cristiano Ronaldo and Juventus either. 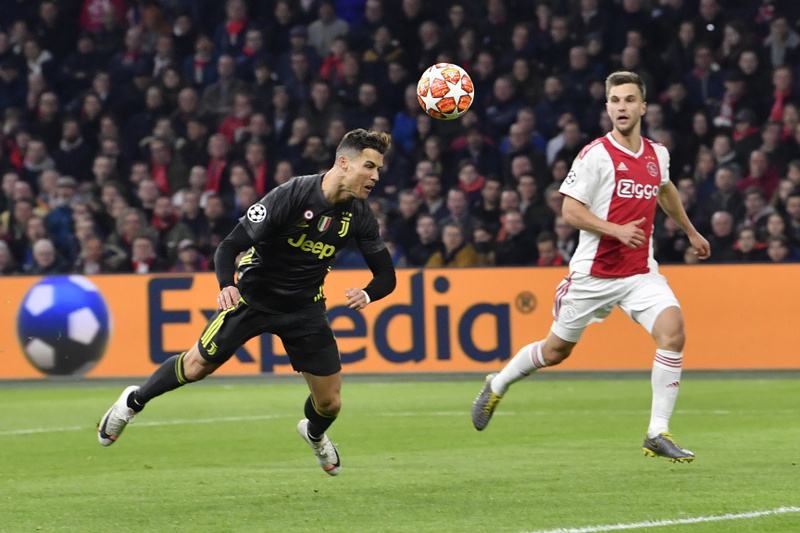 Ajax replied quickly after Ronaldo scored on the stroke of halftime Wednesday, with David Neres equalizing 30 seconds after the break to secure a 1-1 draw in the first leg of their Champions League quarterfinal. "I think we've done pretty well. We have a team with a lot of potential and that tends to emerge to its fullest in Champions League matches," said Matthijs de Ligt, Ajax's 19-year-old captain and center back. "We proved today that Ajax is not in the Champions League quarterfinals because it's a fluke." Showing increasing confidence, Ajax produced more chances early on but then let Ronaldo waltz through to head in a cross in the 45th minute. In the opening minute of the second half, David Neres capitalized on an error from Juventus winger Jose Cancelo — who provided the cross for Ronaldo's goal — and curled a shot into the far top corner. Juventus nearly won it when Douglas Costa hit the post in the 85th. The second leg is scheduled for next Tuesday in Turin, with the winner to face Manchester City or Tottenham in the semifinals. "Everything is open. We need to go to the (Allianz) stadium and try to win it," Juventus goalkeeper Wojciech Szczesny said. "But as we showed against Atletico (Madrid), we know how to win at home in this competition." In the previous round, Ronaldo almost single-handedly overturned a 2-0 first-leg deficit to Atletico by scoring a hat trick in a 3-0 win. "Ajax is a very different team to us," Szczesny said. "They play more attacking and aggressive. But we'll see what happens in the second leg." The match was marred by fan clashes ahead of the game. Police in Amsterdam said they fired a water cannon at football fans "to put out flares and prevent unsafe situations." Local broadcaster AT5 showed images of scores of chanting fans being hosed by the water cannon and responding by tossing fireworks and flares at police before mounted officers charged at them followed by riot police. Earlier, police in the Dutch capital said they had detained dozens of Italians suspected of possessing flares, a knife, pepper spray and fireworks. It was a rematch of the 1996 final won by Juventus in a penalty shootout. In Wednesday's other game, Barcelona won 1-0 at Manchester United. Ajax threatened through Hakim Ziyech early on and Szczesny had to produce a leaping one-handed save to deny the Morocco international. Juventus struggled to get past De Ligt until Ronaldo took matters into his own hands, setting up Cancelo on the right wing then sprinting past several defenders to head in Cancelo's cross. Goalkeeper Andre Onana could only get a weak hand on the ball. "Ronaldo's greatest quality, apart from his talent, is that he is a predator in the box," De Ligt said. "He sees an opportunity, just a tiny gap, and he goes for it incredibly quickly. He sprints into the area between two players." Ronaldo hadn't played since injuring his right thigh while on international duty with Portugal last month but he showed no signs of a problem. It was Ronaldo's 125th career goal in the Champions League. Only Lionel Messi (108 goals) is within 50 of Ronaldo's record, with Raul Gonzalez (71) third on the list. After his goal, a fan jumped over a barrier and ran to embrace Ronaldo and his teammates celebrating near the corner flag. Security quickly took the fan away. Neres, a 22-year-old Brazilian, leveled 30 seconds into the second half with a shot that Szczesny had no chance on. Both teams threatened near the end. Szczesny swatted away a blast from Jurgen Ekkelenkamp before Costa hit the woodwork at the other end with a long, angled shot and Onana palmed away another dangerous effort from Cancelo. Allegri opted not to bring on Moise Kean, a 19-year-old Italy striker who had scored seven goals in his last eight games for club and country.